The Town Hall in Austin. 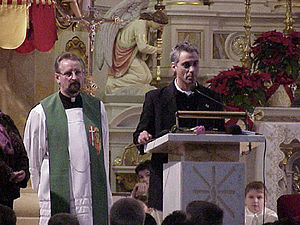 Mayor Rahm Emanuel speaking at St. Hyacinth Basilica in Avondale. The Back of the Yards neighborhood derived from the Union Stockyards, at one time a significant employer in Chicago . Upton Sinclair's 1906 novel The Jungle, revolves around the life of a Lithuanian immigrant working the Stockyards named Jurgis Rudkus. 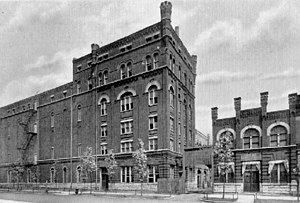 The now-demolished plant of the White Eagle Brewing Company was in Bridgeport and designed by architect John S. Flizikowski. 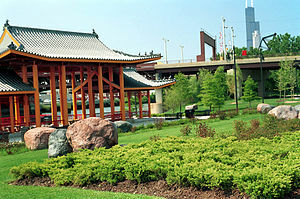 Ping Tom Memorial Park in Chicago's Chinatown. 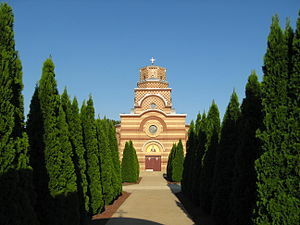 St. Simeon Mirotočivi, a Serbian Orthodox church located in East Side. The literal and ideological corner of Greektown. Fiesta Boricua on Paseo Boricua in Humboldt Park. 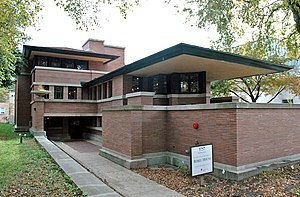 The Robie House in Hyde Park is a Frank Lloyd Wright design. 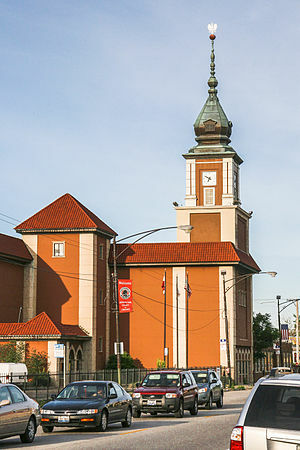 The Gateway Theatre's Solidarity Tower in Jefferson Park is a replica of the Royal Castle in Warsaw. 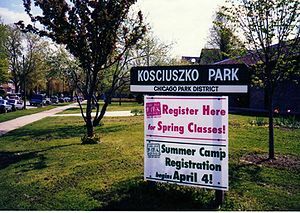 "The Land of Koz" is a nickname for the tongue-twisting proper designation of the neighborhood of Kosciuszko Park. The Krause Music Store in Lincoln Square. 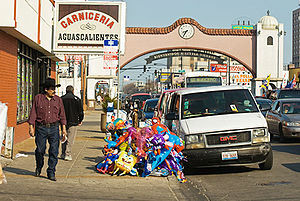 26th Street in Little Village. 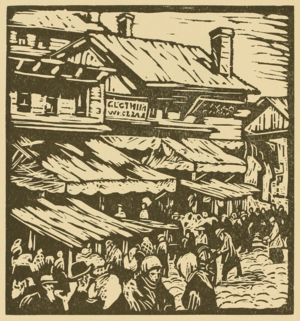 A woodblock print (1925) of Maxwell Street by Todros Geller. 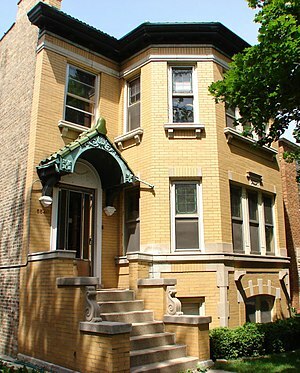 A Portage Park two-flat, or Polish flat, in Chicago's Bungalow Belt. Wacławowo is derived from the Polish name for the church of St. Wenceslaus. Photographer Richard Nickel was married here in 1950. The intersections of North Ave, Damen and Milwaukee in 2010 in Wicker Park. 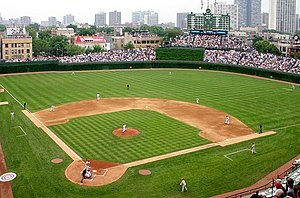 Wrigley Field, from which Wrigleyville gets its name, is home to the Chicago Cubs baseball team. There are sometimes said to be more than 200 neighborhoods in Chicago, though few residents would agree on their names and boundaries. A city ordinance prescribing and mapping 178 neighborhoods is almost unknown and ignored even by municipal departments. Neighborhood names and identities have evolved over time due to real estate development and changing demographics. The City of Chicago is also divided into 77 community areas which were drawn by University of Chicago researchers in the late 1920s. Chicago's community areas are well-defined, generally contain multiple neighborhoods, and are less commonly used by city residents. More historical images of Chicago neighborhoods can be found in Explore Chicago Collections, a digital repository made available by Chicago Collections archives, libraries and other cultural institutions in the city. 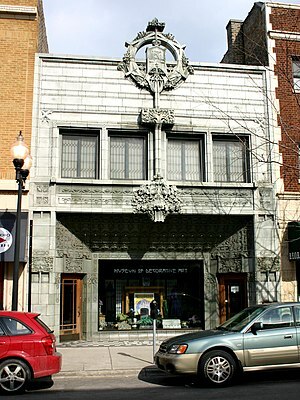 ^ "Chicago in 2011: 200 Neighborhoods, 7 days" Society of American Archivists. Retrieved 11 October 2015. ^ Chicago Municipal Code 1-14-010. ^ a b Pacyga, Dominic (2009). Chicago: A Biography. Chicago: University of Chicago Press. p. 406. ISBN 9780226644325. "Chicago's neighborhood borders and even their names may change, but fierce local identification remains intact. In the 1950s, nobody would have said they live in Village East or River North, but now most know those newly named neighborhoods" ... "Who names neighborhoods? Often developers looking for a quick buck name them." ... "If you try to find Wrigleyville on the official community area map of Chicago, you will be disappointed, as you will be if you search out such legendary neighborhoods as Canaryville, Back of the Yards or Hamburg on the South Side." ^ "Community Areas". Encyclopedia of Chicago. Chicago History Museum. Retrieved 18 September 2013. ^ Keating, Ann Durkin (2008). Chicago Neighborhoods and Suburbs: A Historical Guide. Chicago: University of Chicago Press. p. 90. ISBN 0226428834. "Despite the uses scholars and planners have found for community areas, they do not necessarily represent how Chicagoans think about their city... Prominent neighborhoods like PILSEN and BACK OF THE YARDS are subsumed into the less familiar LOWER WEST SIDE and NEW CITY." ^ Long, Elizabeth. "A Single Portal to Chicago's History". The University of Chicago News. Retrieved 17 September 2016. 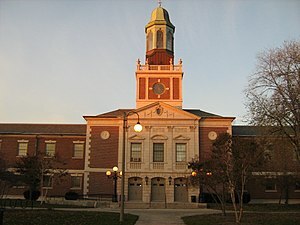 Wikimedia Commons has media related to Neighborhoods in Chicago. 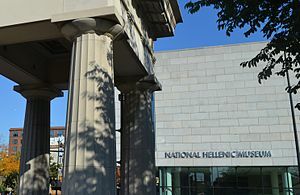 This page was last edited on 29 March 2019, at 00:35 (UTC).